Many theories exist about the origins of cricket. One suggests that the game began among shepherds hitting a stone or a ball of wool with their crooks and, at the same time, defending the wicket gate into the sheep-fold (from Anglo Saxon ‘cricce’, a crooked staff). A second theory suggests the name came from a low stool known as a ‘cricket’ in England, which from the side looked like the long, low wicket used in the early days of the game (originally from the Flemish ‘krickstoel’, a low stool on which parishioners knelt in church). There is also a reference to ‘criquet’ in North-East France in 1478 and evidence that the game evolved in South-East England in the Middle Ages. In reality, there would have been a large number of different games played under a variety of local rules. The idea of a single past time evolving seamlessly into the sport we know and love is appealing but highly unlikely. However, hitting a ball with a stick does seem to have been a popular past time. Whatever the origins or variety of games played, records show Edward II wielding a bat, and, subsequently, it was suggested Cromwell was also partial to a game. In fact, “bat” is an old English word meaning stick or club. The earliest types of bat were rather like a hockey stick – long, heavy clubs curved outwards towards the bottom. The design of the bat reflected the type of bowling that was prevalent at the time – fast, underarm bowls rolled along the ground. By the eighteenth century, the bat had developed into a longer, heavier, curved version of our modern bat – the handle and blade were carved out of a single piece of wood. The first recorded match took place in Kent in 1646 and, by the late 1600s, it was noted that fines were handed out for those missing church to play. Cricket was popular and widely documented in England during the 1700s. In 1706 William Goldwyn published the first description of the game. He wrote that two teams were first seen carrying their curving bats to the venue, choosing a pitch and arguing over the rules to be played. They pitched two sets of wickets, each with a “milk-white” bail perched on two stumps; toss a coin for first knock, the umpire called “play” and the “leathern orb” was bowled. They had four-ball overs, the umpires leant on their staves (which the batsmen had to touch to complete a run), and the scorers sat on a mound making notches. The first written “Laws of Cricket” were drawn up in 1744. They stated, “the principals shall choose from amongst the gentlemen present two umpires who shall absolutely decide all disputes. The stumps must be 22 inches high and the bail across them six inches. The ball must be between 5 & 6 ounces, and the two sets of stumps 22 yards apart”. There were no limits on the shape or size of the bat. It appears that 40 notches was viewed as a very big score, probably due to the bowlers bowling quickly at shins unprotected by pads. The world’s first cricket club was formed in Hambledon in the 1760s and the Marylebone Cricket Club (MCC) was founded in 1787. During the 1760’s and 1770’s it became common to pitch the ball through the air, rather than roll it along the ground. This innovation gave bowlers the weapons of length, deception through the air, plus increased pace. It also opened new possibilities for spin and swerve. In response, batsmen had to master timing and shot selection. One immediate consequence was the replacement of the curving bat with the straight one. All of this raised the premium on skill and lessened the influence of rough ground and brute force. It was in the 1770’s that the modern game began to take shape. The weight of the ball was limited to between five and a half and five and three-quarter ounces, and the width of the bat to four inches. The latter ruling followed an innings by a batsman called “Shock” White, who appeared with a bat the width of the wicket. In 1774, the first leg before law was published. Also around this time, a third stump became commonplace. By 1780, three days had become the duration of a major match, and this year also saw the creation of the first six-seam cricket ball. 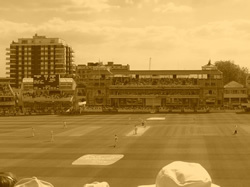 In 1788, the MCC published its first revision of the laws, which prohibited charging down an opponent and also provided for mowing and covering the wicket in order to standardise conditions. The desire for standardisation reflected the massive increase in the popularity of cricket during the 18th Century. Between 1730 & 1740, 150 cricket matches were recorded in the papers of the time. Between 1750 & 1760, this figure rose to 230, and between 1770 & 1790 over 500. The 19th Century saw a series of significant changes. Wide deliveries were outlawed in 1811. The circumference of the ball was specified for the first time in 1838 (its weight had been dictated 60 years earlier). Pads, made of cork, became available for the first time in1841, and these were further developed following the invention of vulcanised rubber, which was also used to introduce protective gloves in 1848. 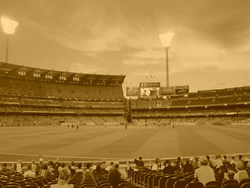 In the 1870’s, boundaries were introduced – previously, all hits had to be run, and if the ball went into the crowd, the spectators had cleared a way for the fieldsman to fetch it. The biggest change, however, was in how the ball was delivered by the bowler. At the start of the century, all bowlers were still delivering the ball under-arm. However, so the story goes, John Willes became the first bowler to use a “round-arm” technique after practising with his sister Christina, who had used the technique, as she was unable to bowl underarm due to her wide dress impeding her delivery of the ball. In 1816, responding to the increasing number of bowlers who were now using “round-arm”, the MCC decreed “the ball must be delivered underhand, not thrown or jerked, with the hand underneath the elbow at the time of delivering the ball”. Previously, no such legislation had been needed. However, by the 1830’s, round-arm had become increasingly popular and eventually it was permitted by the MCC who, in 1835, deigned to allow any delivery “not thrown or jerked in which the hand or arm did not go above the shoulder”. By the 1860’s matters had developed further and some bowlers were experimenting with over-arm, although it was still outlawed by the laws of the game. In practice, some umpires allowed it whilst others called “no-ball”. Does this sound familiar? After years of heated discussion, with some traditionalists even wanting to abolish round-arm and return to under-arm, over-arm was finally legalised in 1864. As you would imagine, the practitioners of under-arm and round-arm stayed in the game, and were by no means unsuccessful. However, the majority of newcomers used over-arm and, by the 1880’s that was the prevalent method of delivering the ball. Interestingly, round-arm disappeared before under-arm, which was still being employed until World War 1. Given that Australia first fielded an entirely over-arm attack in 1878, it now seems extraordinary that England occasionally selected under-arm bowlers even in the early part of the 20th Century. Most famously, Simpson-Hayward toured South Africa in 1909-10 and the “lobster” was England’s most successful bowler with 23 wickets at 18 a piece. 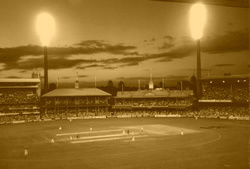 Thereafter, cricket became recognisably the game that is played today, despite subsequent changes regarding leg before dismissals, no balls, intimidatory bowling, the weight of the bats, covered wickets and protective clothing. In the wake of England’s recent tour of South Africa, the thought of Harmison strolling up to the wicket and delivering the ball under-arm does have a certain appeal, and it’s tempting to suggest that he could scarcely have achieved worse results with the old fashioned technique. Trescothick would surely love to have used Shock White’s oversized bat to keep out Ntini’s delivery that made a horrible mess of his stumps in the nail-biting finish to the series. Kallis, of course, spent much of the series looking as if he was doing exactly that, but that’s another story.